What better day to talk about birthday t-shirts than on your birthday?! Today is MY birthday and I love thinking about the heartfelt gift I received from my two young daughters. They designed a t-shirt just for me for my birthday! As you can imagine, I was thrilled when I saw what my daughters had created. What a wonderful idea for a gift! I especially love that I get to hold onto one on my babies’ creations for a lifetime rather than a day. I loved my birthday shirt so much that I’ve decided to make designing birthday t-shirts a new tradition for our family! You should think about doing the same! 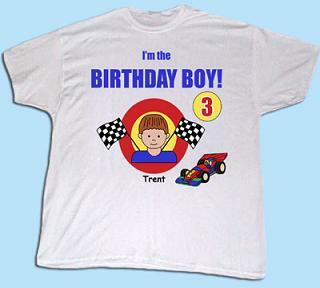 Who wouldn’t love to receive a shirt designed by a family member, friend, or anyone for their birthday? It makes a great surprise and a gift to last forever! I have two birthdays coming up this year for two amazing kids. Of course, there are many other birthdays such as friends, other family members, etc. My girls have given me the best idea for a meaningful gift! I am thrilled that I can simply use discount t-shirts to make outstanding memorabilia. Even better, when it comes time to design the t-shirts the possibilities are endless! The toughest decision will be whether to have the shirts airbrushed, painted, or even printed. I suppose if it’s a rather large party the shirts would be printed or I may apply heat transfers to them. If it’s a smaller party I may allow each guest to design a shirt for the birthday girl! That would be a great surprise for any birthday girl or boy! I must admit, of all the gifts and Happy Birthdays I have received, my custom designed t-shirt is the best gift of all. I love the glitter, puffy paint, and every detail about the shirt I received. I think everyone should have birthday t-shirts! You can even make them for the birthday party guests! A surprise party would be an even greater surprise for the birthday girl or boy if all of the surprise guests were wearing crafted t-shirts! What an amazing idea!